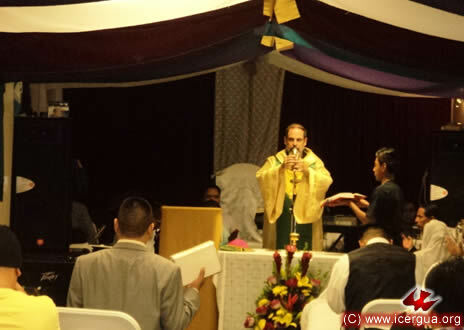 On Saturday, October 3, the bishop began his monthly pastoral visits, as he usually does, in the San Miguel Parish, Los Angeles, California, with the celebration of the Eucharist in the parish see. Left: The team of servers for the Mass, just before the entrance procession. 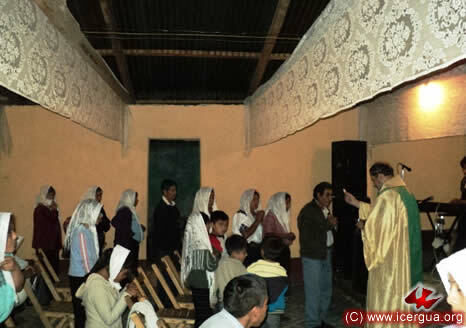 Right: After a catechesis based on the sacrament of Reconciliation, the faithful had the opportunity to confess their sins and then to come forward to receive Absolution individually. 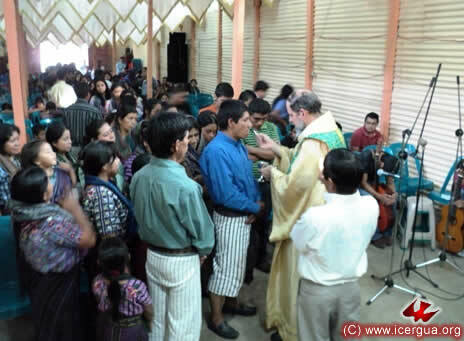 During the homily the bishop invited all the members of the community to revitalize their missionary commitment. It is essential that everyone be aware of the missionary dimension implicit in our calling and that it be carried out. 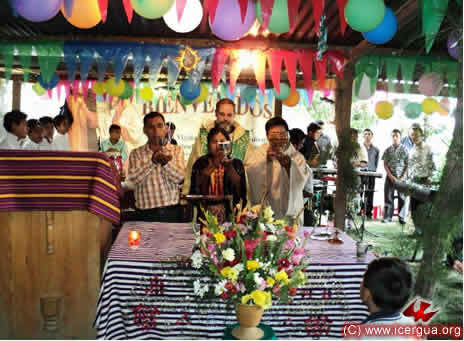 In late afternoon, Monsignor Eduardo visited the Pacto Divino Community to participate in a vigil that the faithful were celebrating, beginning with the Eucharist and ending at midnight. The community has grown remarkably over the past few months, and the solidification of its identity and the steadfastness of its members’ participation has kept pace with the growth. 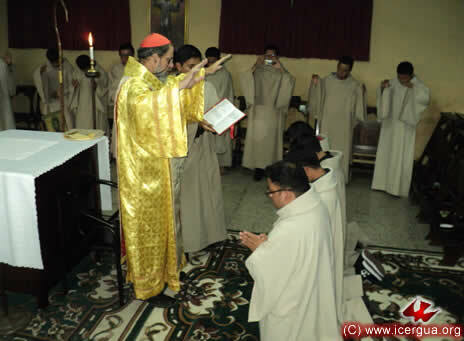 With the vigil, the faithful formally began the month of preparing for the celebration of its twelfth anniversary. God willing, the bishop will return on the first of October for that celebration. While praying the Our Father, the members of the music ministry and the other ministers at the altar along with the bishop raise their hands as a sign of fellowship. 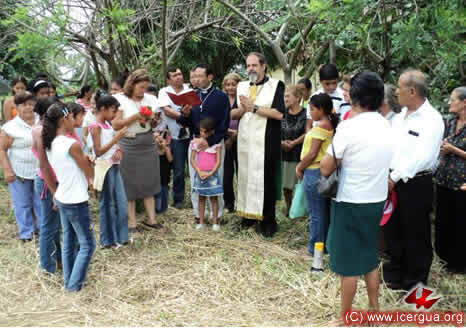 In the evening the bishop celebrated with the Restauración Community. This community has maintained steady growth. Its members say that this growth not only makes them very happy but also it inspires them to keep on working and solidifying their ministry. After making the confession of the sins, most of the faithful came forward during the sacrament of penance to receive Absolution. The community is becoming organized step by step. At present there is a communion minster and a server at the altar and a good team to lead the liturgical singing. On Sunday morning, October 4, the bishop met for more than four hours with the DETYM students and some servers in the community. This time the meeting had two special features. It was agreed that on Sunday, October 2, instead of classes, there would be an Assembly with all the servers. Two courses began: one on the Johannine Writings, and the other on the History of the Ancient and Medieval Church. 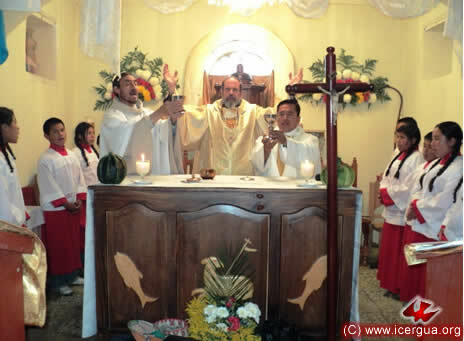 The goal of the October 2 Assembly will be to organize the parish so that it can offer everyone the services that are expected of a parish: catechetical preparation for receiving the sacraments, the celebrations of the Word with distribution of communion when it is not possible to celebrate the Eucharist. The DETYM students were urged to consider making themselves available to take on the parish’s catechetical work. On Sunday afternoon, September 4, Eucharist was celebrated with the DETYM students and some of the servers. The special purpose of the Eucharist was to pray for the preparation of the Parish Assembly that is to be celebrated October 2. 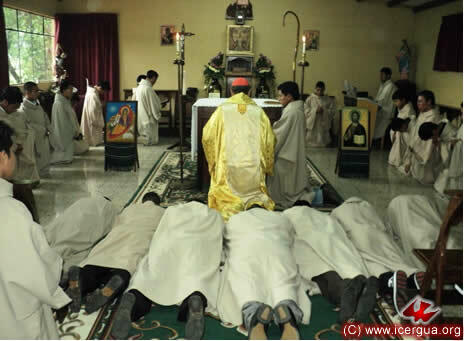 The faithful have been taking on more and more commitments and ministries to enrich the liturgy, as can be seen in the photographs above and at the right. 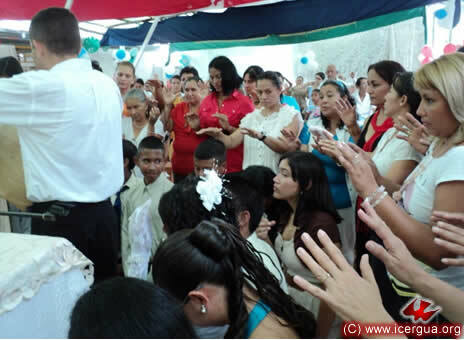 With great devotion, the members of the ministry as well as the majority of participants came forward to receive Holy Communion. 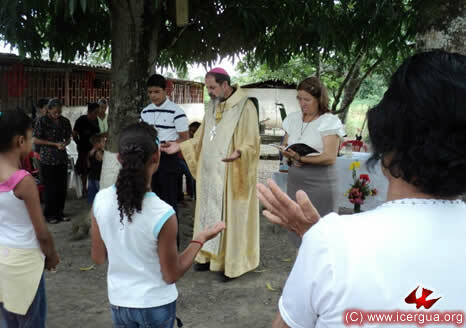 Eight months ago several communities of the state of Portuguesa in Venezuela began a communication with our bishop, which has continued into the present. 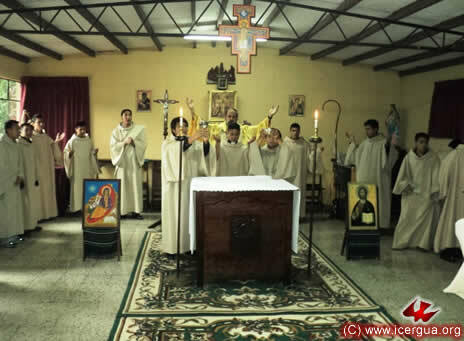 For several years they had been working without any ecclesiastical protection, assisted only by Father José Roberto Aguirre, whom they had sought out to accompany them on their faith journey. 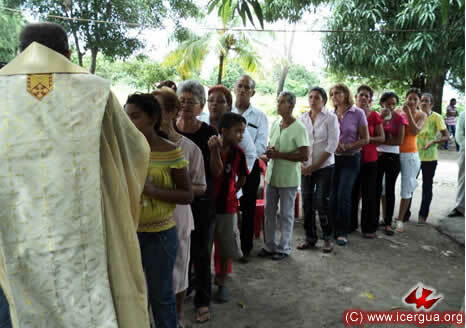 After a series of dialogues, which confirmed that their faith coincides fully with ours and their vision of the Church is the same, they formally requested to enter our Church, and planned the bishop’s first visit to Venezuela. This took place from September 9 to 13. 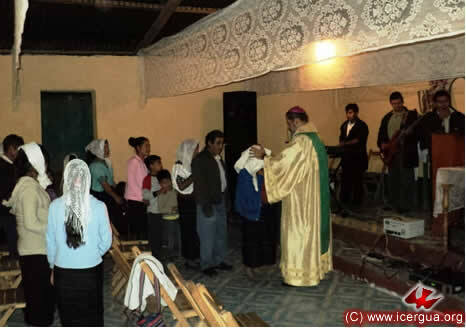 The bishop’s visit began in the town of San Rafael de Onoto in the state of Portuguesa. At the city entrance, he was received by representatives of the various communities and by a group of children and young people. They walked together from there to the mission’s temporary headquarters. The procession can be seen in the photograph above. 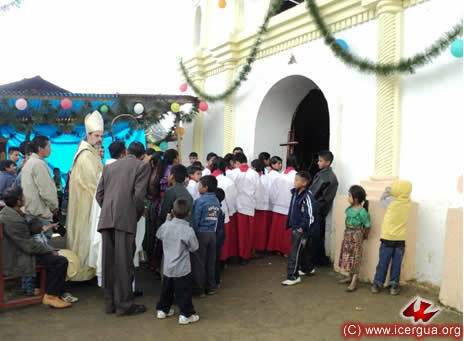 On arriving at the headquarters, which consists of a house of several rooms and, in the back, a large patio for celebrating Eucharist, the bishop was received by more representatives of the communities. 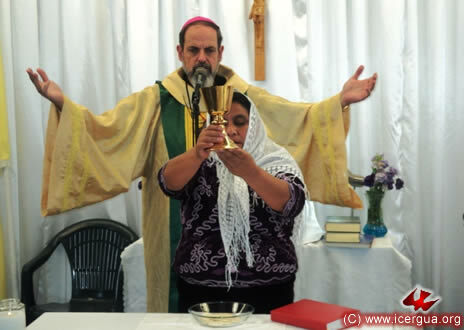 After the vote, the bishop proceeded to sign the decree creating the ICERVE mission within the Communion of Saint Mary of the New Exodus, and gave the decree to Sra. Beatriz, the president of the Pastoral Council. The entire Assembly broke into applause at this solemn moment. 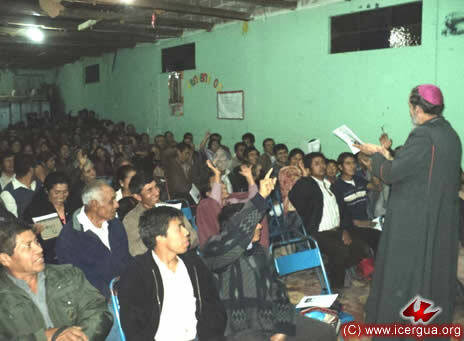 In addition everyone accepted without reservation the commitment to work for ICERVE to carry out the mission of evangelism in many other places. 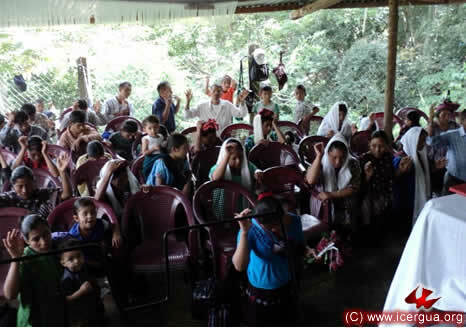 The mission at present consists of about 12,000 parishioners, of which 7,000 are in San Rafael Onoto, 3,000 in the Municipality of Páez, and about 2,000 divided among Agua Blanca, Acarigua and Arure. 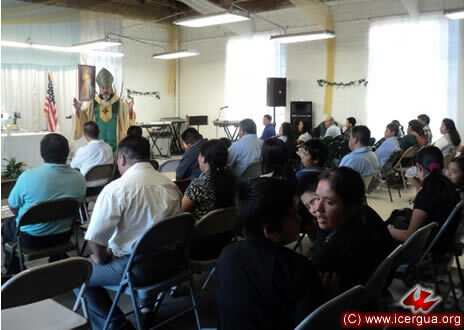 Then the bishop proceeded to explain the significance of creating a Renewed Catholic Parish. The procedure that was followed was like the previous one: first the explanation, then responses to questions from members of the Assembly, and finally the vote to see if the People of God were inclined to be a established as a Renewed Catholic Parish. To carry out faithfully all the commitments apertaining to a parish, in accord with our Constitution. To choose and then appoint a presbyter for the parish. The entire proposal was approved joyfully and unanimously. 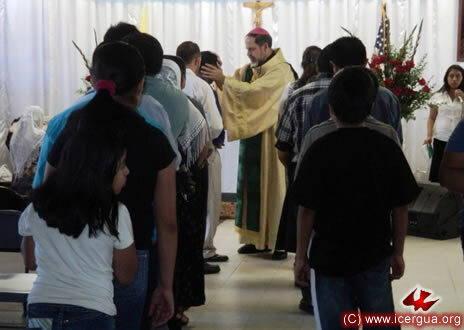 After the vote, the bishop proceeded to sign the decree creating the Renewed Catholic Parish of “San José,” which for the time being will be the pastoral center for all the communities located in the four municipalities where the Renewed Catholic Church is present. In the photograph above, the bishop is delivering the decree creating the parish to the Vice President of the Council, which from this time forward will have the name, Parish Council. 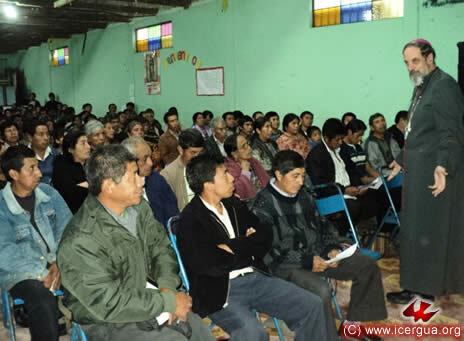 As their presbyter the People of God chose José Roberto Aguirre Lima, who has been with them in a pastoral capacity from the very beginning. 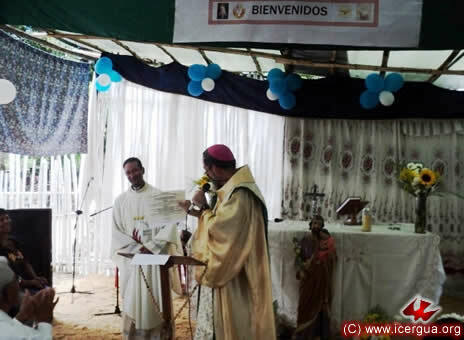 The bishop signed the decree and the appointment and, in the photograph at right, handed it to Father José Roberto. 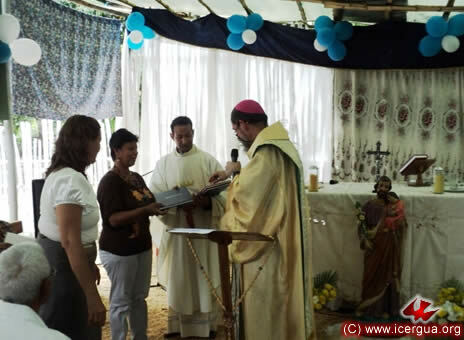 Afterwards the secretary of the Parish Council came to receive the books for registering the administration of the Sacraments, duly authorized by our bishop, Eduardo. Finally, the bishop turned over the books for the celebration of the liturgy (the missal, the rites, and the readings) to those responsible for the liturgical team. 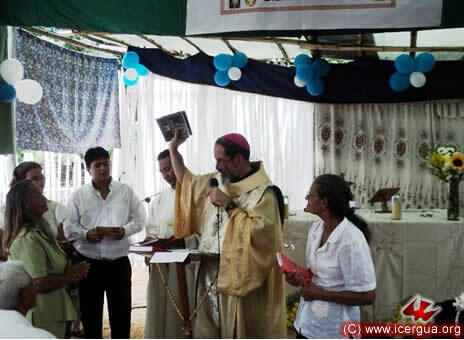 He also gave books to be used for preparing people to receive the sacraments to members of the catechetical team, which is pictured in the photograph at right. A group of children and young people had been beautifully prepared to receive communion. The liturgical celebration began with the sacrament of Reconciliation for all who wanted it. After making the confession of their sins, those who came forward received Absolution individually, as can be seen in the photograph at right. After Absolution, the Assembly prayed that by the outpouring the Holy Spirit those absolved from their sins might be freed from all ties, prohibitions, and temptations. At the end of the celebration, the bishop posed for photographs. 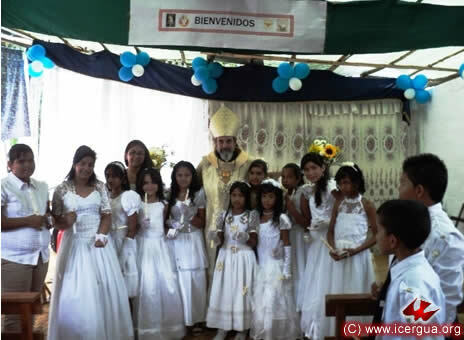 Right: Some of the girls who had done their Communion with the bishop. At the extreme right is a group of boys, who were waiting for their turn to be photographed. On Sunday morning, September 11, in the parish see, the bishop presided at another Eucharist. In it, a group of young people received confirmation, and communion ministers were installed. 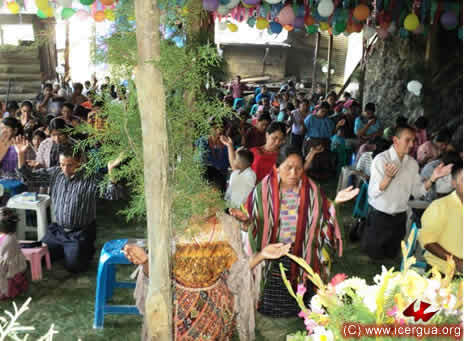 In addition the members of the Ministry of Intercession and of the legion of Mary were blessed. 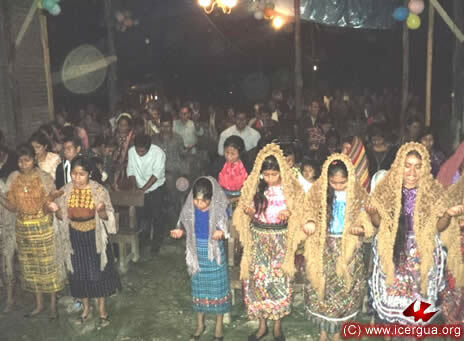 About five hundred faithful participated in the celebration. Everyone followed its every aspect with enthusiastic attention. 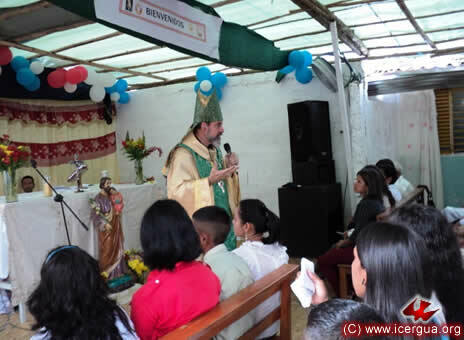 In the homily, Monsignor Eduardo emphasized that confirmation implies reaffirming the presence of the Holy Spirit, which was received when Christian Initiation was administered, and which specifically involves the evangelizing mission entrusted to all the apostles of Jesus. He also urged all those present to let the Lord quicken the presence of the Holy Spirit in them so that they might be united in giving witness to the presence of the Kingdom and to work arduously in the evangelizing endeavors. 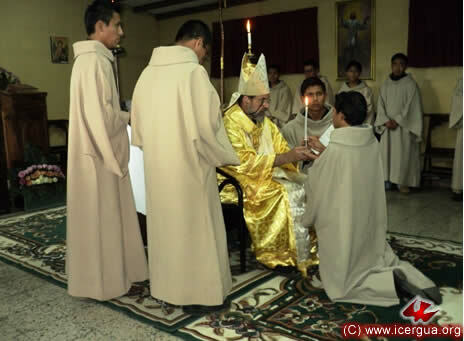 Before beginning the rite of Confirmation, a young man was initiated with the administration of the sacrament of Baptism, shown in the photograph at left. Afterwards, baptized as well as confirmed, they were anointed with the Holy Chrism, so that they might fully participate in the mystery and the mission of Christ—priest, prophet and king. Right: The bishop anointing each of the candidates with the chrism. After the liturgical ceremony of chrismation, the parents and sponsors prayed over those who had received chrism, invoking the Lord and asking him that the sacrament received might bear abundant fruit in the life and witness of all those who received it. Then the installation of communion ministers began. 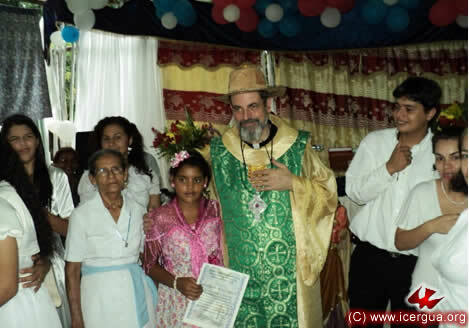 Five members were installed: Silimar and Elio for Acarigua and Arure; the Conde couple for the center of San Rafael de Onoto and Sra. Arelly for Cocuizas. Then came the blessing for the intercession ministry. 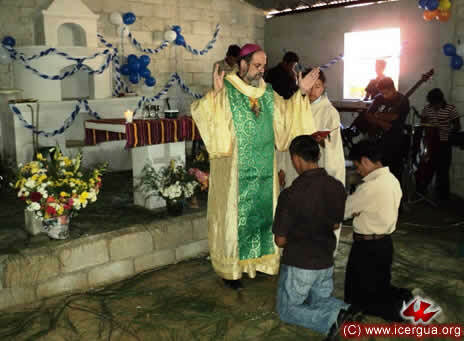 Left: the bishop praying over Giovanni, one of the members of this ministry. Finally came the blessing and giving of insignias to the members of the Legion of Mary. These brothers, besides promising to accept Saint Mary as Mother and Model, are extremely active in pastoral and charitable work in the parish. 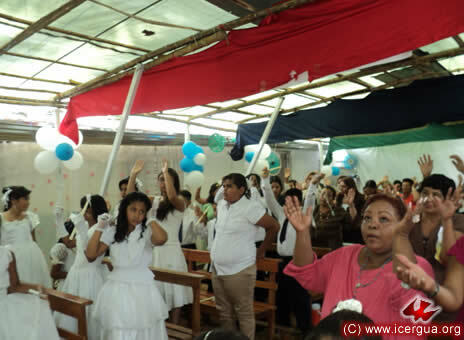 After the administration of Christian Initiation and Confirmation, and after the installations and blessings of the ministries, the Eucharist was celebrated. 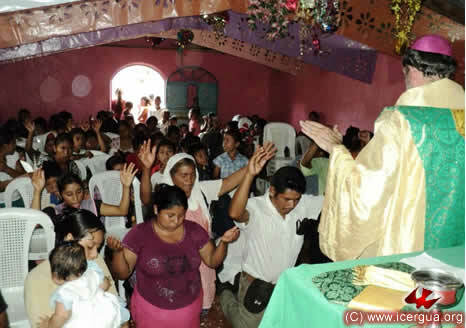 The People were joyous, and their happiness and fellowship was shown when they joined hands in praying the Our Father. 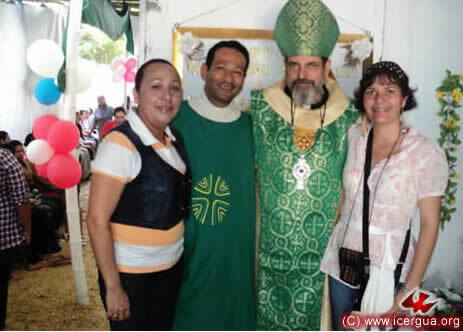 At the end all the faithful who had been initiate into Christian life or were confirmed want to pose with the bishop and Father José Roberto, as shown in the photograph at right. Among those were who confirmed were two sisters who wanted to present to eh bishop a sheepskin hat. The bishop accepted it with joy and gratitude and posed with it and the two sisters who have brought the present. Some of the Intercession Ministers and other ministers also wanted to be photographed with the bishop. Right: The members of the Intercession Ministry and some of the Liturgy Ministry members. The members of the Legion of Mary were particularly happy. For two years, they were one of the pillars that sustained the Catholic faith and organized the communities to be ready to be incorporated into our Church and be established as a Renewed Catholic Parish. 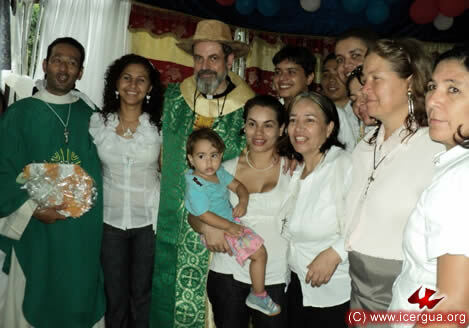 Left: Some of them with the bishop and Father José Roberto. During the entire visit, the support and company of Sr. Francisco and his wife, Dr. Migdalia, was providential. They were responsible for leading the bishop to the different places, as well as for his accommodations in a lovely hotel in Acargua. This couple’s unaffected eagerness to serve nourished the bishop, he said. Right: Sra Dr. Migdalia and Father Roberto with Monsignor Eduardo at the end of the Eucharistic celebration. 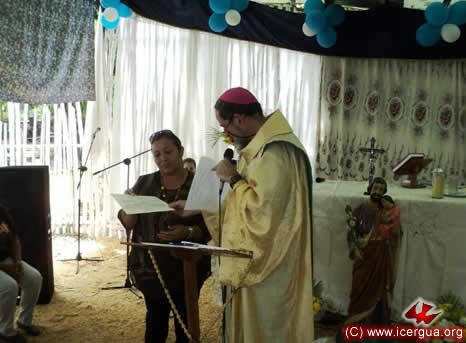 At the right of the bishop is a sister from Guanare who is part of the Intercession Ministry and served as photographer in the ceremonies on Saturday and Sunday. To close the entire celebration, the faithful had prepared a time of fellowship when everyone could share their love for one another. 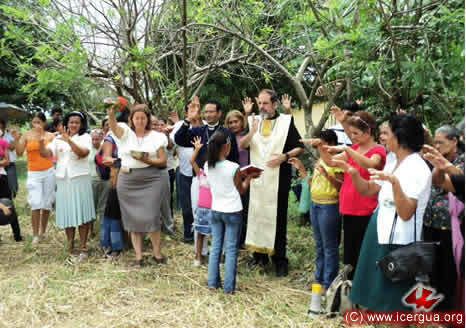 On Monday, October 12, the bishop went to Cocuizas subdivision. 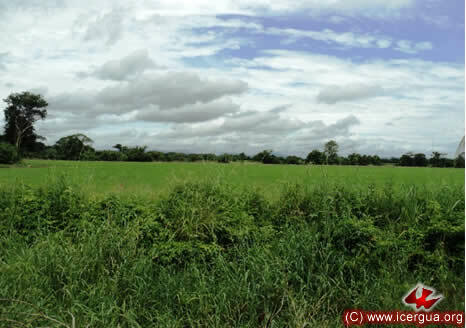 It is an area near to San Rafael de Onoto, but is under the administration of the municipality of Páez. There were two reasons for the visit. Above all it was to meet with some of the leaders of the thirty-eight communities that are scattered about this area. And the second was to bless the lot on which, God willing, the church of the “Renewed Catholic Parish of San Antonio de Padua” will be built. The bishop was received with great joy. The fact that he was wearing the hat that is typical of the region made the faithful feel he was closer and more accessible to them. The ceremony of blessing the lot in which the parish church will be built began with reading the passage in the Gospel that speaks of the importance of building on the rock of faith and in fulfillment of the will of God. After the Gospel reading and the bishop’s brief reflection on it, everyone prayed over the land, asking God’s blessing. Then the bishop sprinkled the area with holy water, and everyone formed a large circle to pray the Our Father and receive the blessing. Left: Then some of those present posed with the bishop. After the ceremony of blessing, the bishop went to the temporary chapel where Eucharist is now usually celebrated. 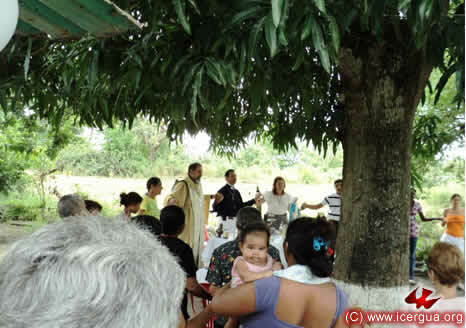 In view of the number of participants and the beauty of the day, Eucharist was celebrated outside under the shade of two large mango trees. The celebration began with the administration of the sacrament of Reconciliation. Those present confessed their sins with humble devotion, invoked the outpouring of the Holy Spirit, and individually received Absolution. When the Eucharistic prayer was completed. everyone joined hands to pray the Our Father and prepare to receive communion. The participation in the communion was huge. All those who had prepared themselves appropriately through the sacrament of Reconciliation and prayer came forward to commune. It was a joyous and blessed feast. 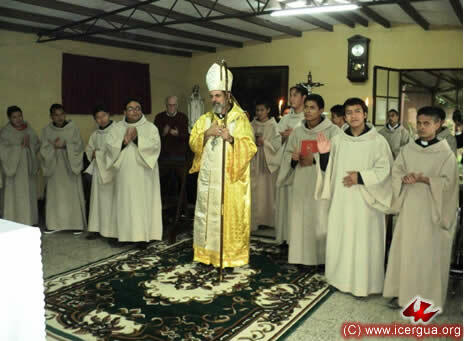 With this ceremony the visit of Monsignor Eduardo to the new mission ICERVE was officially over. 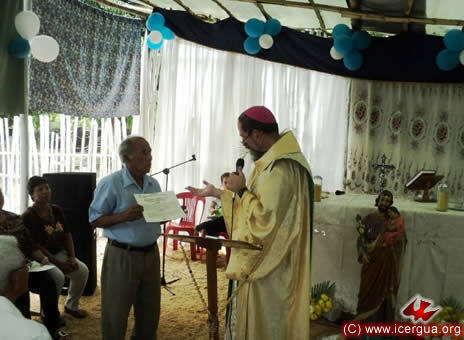 The bishop thanked all the participants, especially Father José Roberto for having kept faith through all the years in the midst of trials and persecution. He urged everyone to keep moving forward, carrying out all the commitments involved in being Renewed Catholics and in accepting a part in the mission that Christ entrusted to his apostles. At the end, he said goodbye to the People of God. Everyone came up to him with joy, gratitude and nostalgia. Over the course of the three days, many tears flowed down the cheeks of the parishioners. After so many years of being alone, they felt that the Lord had heard their cry. They saw that the Gospel was being fulfilled, that today too the last were first in the life and mission of the Church. God willing, the next visit will be at the beginning of 2012. 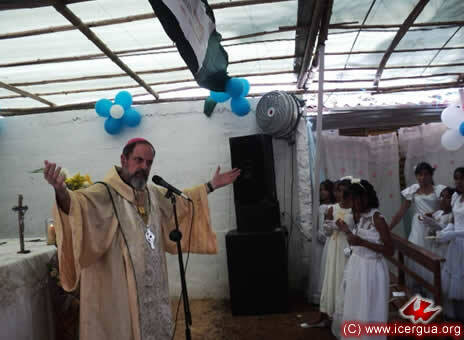 The faithful reaffirmed their promise to carry out faithfully the mission received and to support Father José Roberto in consolidating the mission. 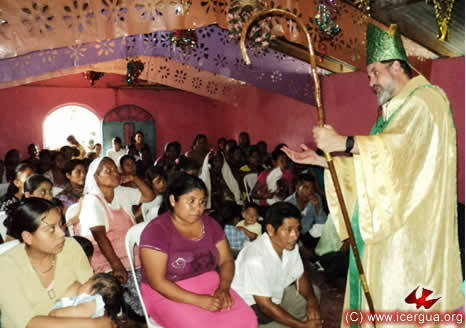 On Friday, September 16, our bishop continued his missionary work by visiting the Cenegal Community in the municipality of La Libertad, Huehuetenango. This community was born only recently. Its leaders are working hard, and since the bishop’s visit last May six new families—a total of about fifty new members--have joined it. 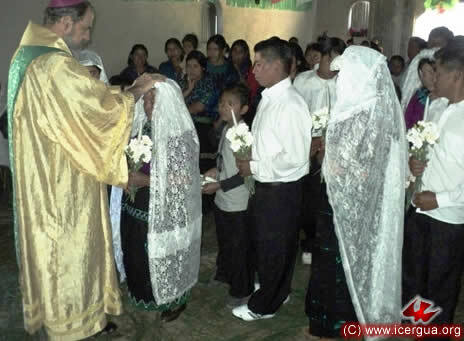 For the bishop’s arrival, the faithful had prepared the Christian Initiation of two sisters and the marriage of a couple. The Christian Initiation was for a little girl, the daughter of the couple being married, and for a young lady who, having been excellently prepared, was eager to join the Church. Right: The new husband and wife, carrying in their arms their daughter who had been baptized, coming forward to receive communion. In the municipality of La Democracia. The community has bought a lot and now have the place to build its church. 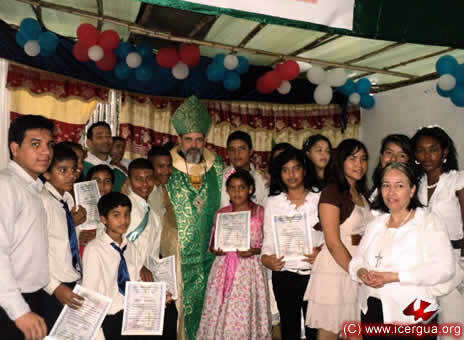 On the occasion of the bishop’s visit, in addition to the celebration of the Eucharist, Initiation into Christian Life took place for 14 children, many of whom came from the nearby community of San José Ixcunén. These two communities have joined the Church recently. Since then they have experienced powerful growth and their members feel called to carry their commitment to evangelism forward. During the homily the bishop did a catechism on the topic of Initiation into Christian Life, focusing especially on the commitment that the parents and sponsors take on. 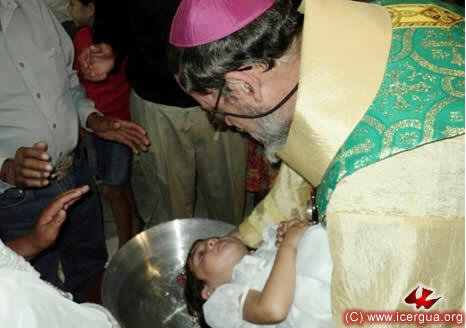 To baptize the children implies a promise of faith on the part of those presenting the children, for it is based on their faith, which carries out the children’s baptism. 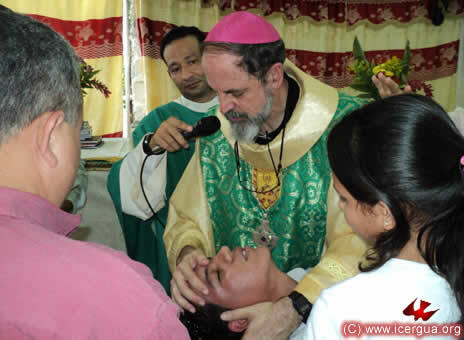 After being anointed on the forehead and the shoulder with the oil of the catechumens, the bishop and the whole Assembly prayed that the water might be sanctified. After the formula, “Servant of the Lord, you are baptized in the name of the Father, and of the Son, and of the Holy Spirit,” he proceeded to baptize each of the fourteen children. After the baptism, the children was chrismated, and then communion was given to those who were prepared for it, shown in the photograph at right. 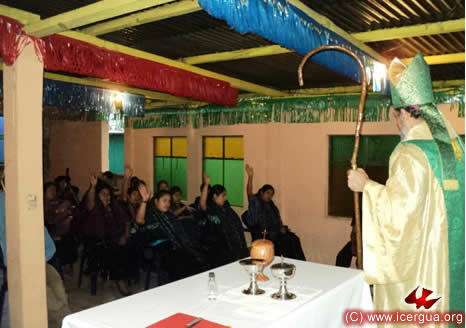 On Saturday morning, September 17, after a two-hour drive in the car from Huehuetenango and a two-hour walk up a steep hill, Monsignor Eduardo arrived at the El Sisilar Community. 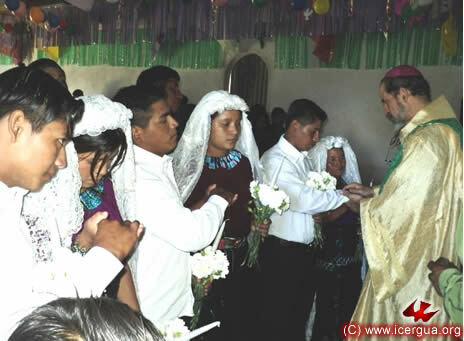 The Christian Initiation of a large group of the faithful and the celebration of four weddings were the pastoral assignments waiting for him. The liturgical celebration began with the administration of the sacrament of Reconciliation for all those who felt the need for it. After the communal confession, the bishop administered Absolution to each of those who had confessed their sins. The homily on this occasion centered on all the promises that go with the grace received, both in the sacraments of Christian Initiation and in that of matrimony. Within the framework of the Eucharistic celebration, the administration of the Christian Initiation began right after the homily. First, the candidates received baptism. 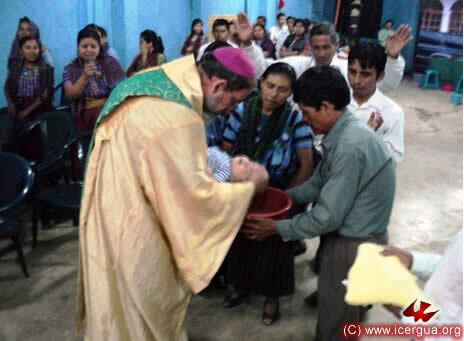 Right: The bishop administering baptism to one of the children. Then, all those who had been baptized were chrismated. Left: The bishop chrismating Ferlandi, who had been baptized and later was to contract matrimony. 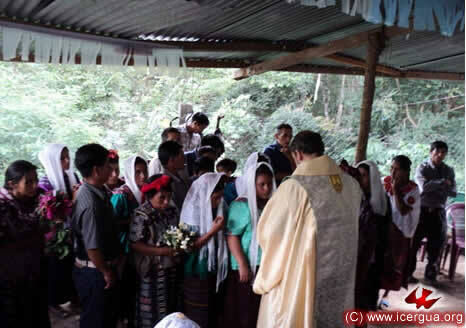 The celebration of four marriages in a small community such as Sisilar is a visible sign of the commitment of the faithful to try to live the Renewed Catholic faithfully and completely. Right: One of the couples (Ferlandi y Honoria), exchanging rings and coins, as a sign of their fidelity and the sharing of earthly goods, which marriage implies. 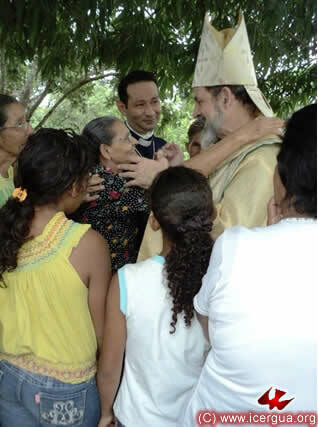 In the afternoon Monsignor Eduardo went to Santo Domingo. This community is located at the foot of the mountain where the walk to Sisilar begins. 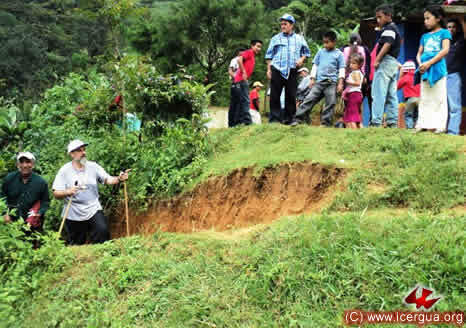 It is part of the municipality of La Libertad, Huehuetenango. The faithful have grown a lot in recent years. On this occasion, seven of them had been prepared for Initiation into Christian Life. During the homily, based on the parable of the Sower the bishop urged the faithful to examine their attitudes to see how they receive the Word of God and the Lord’s call to be disciples. 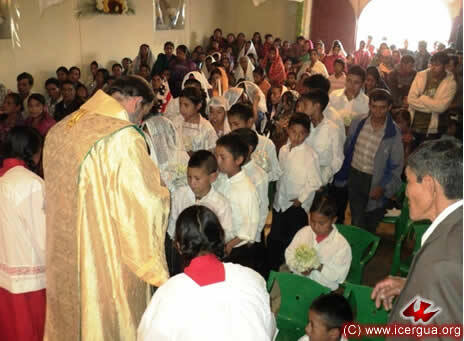 The bishop asked the parents and the sponsors of the children who were baptized and chrismated to be especially aware that whether the seed of the Holy Spirit that their children were about to receive would grow and bear abundant fruit would depend to a large extent on their faith. 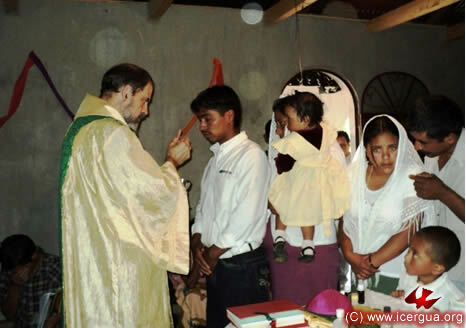 All the faithful seemed to be fully aware of the commitment that they had accepted in bringing their children to be initiated into Christian Life. All of them expressed their promise to live a life of active faith so that the seed planted in the hearts of those who would receive the sacraments would fall onto good soil and bear much fruit. Among those initiated was the little daughter of the sister who is the community’s cantor. 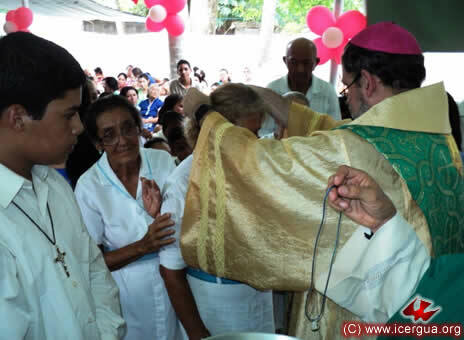 Right: The bishop, the baptized girl, her mother (the cantor), and, holding the baptismal font, brother Juan, leader of the community and tireless apostle. 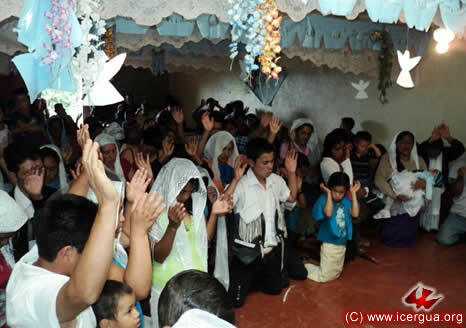 On Sunday morning, September 18, two thirds of the Renewed Catholic Community of the vaillage of Cancela in the municipality of Aguacatán, Huehuetenango, sealed the covenant by which they became members in our Church. 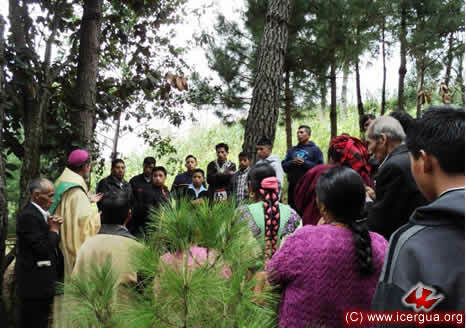 Owing to environmental difficulties, the Eucharist could not be celebrated in the community’s church, and so it took place in a beautiful forest, which is owned by one of the members of the community. The celebration began with the administration of the sacrament of Reconciliation for those who expressed the need for it. Right: Invoking the Holy Spirit after the confession of sins. During the homily the bishop explained carefully the promises that a Renewed Catholic community makes. 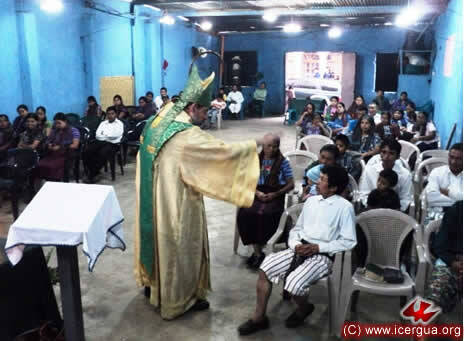 He also urged the faithful to keep on working in evangelism, bringing more and more members of the community into the Church and carrying the Good News to neighboring communities since there are only two Renewed Catholic Communities in the area. 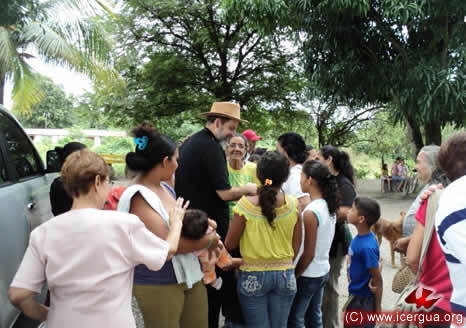 On Sunday afternoon, September 18, the bishop visited the Brasilia Community in Zone 7, Huehuetenango. 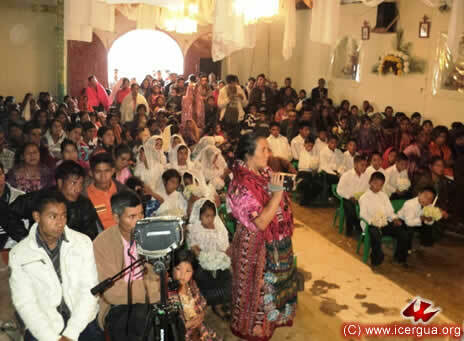 About three hundred faithful participated in the celebration. It was the sixteenth anniversary of the community’s beginning. The community’s greatest joy was the extensive growth it has experienced recently. Within the framework of the celebration, two little girls were initiated into Christian Life through baptism and chrismation. 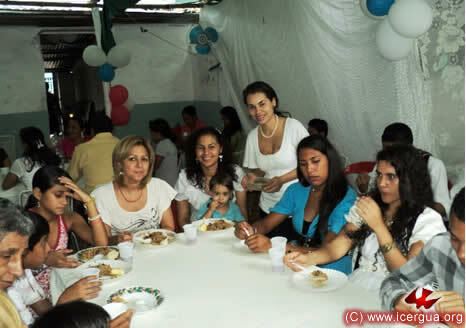 In addition two other sisters completed Christian Initiation by receiving communion for the first time. 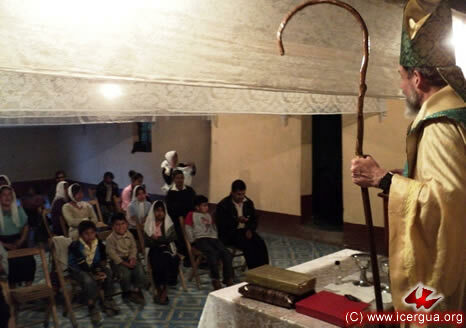 In the evening Monsignor Eduardo celebrated Eucharist with the Sipal Community in San Sebastián, Huehuetenango. After a series of difficulties, this community is now ready to move its spiritual life and growth forward. 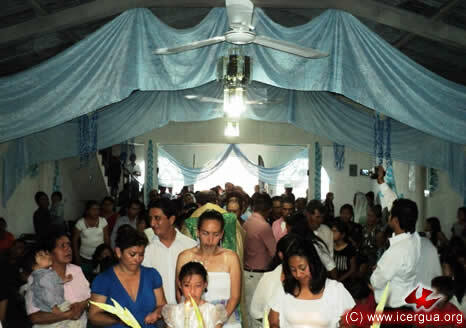 Their goal is to work with other ICEREGUA communities in this municipality in order very soon to become a Renewed Catholic Parish. At the beginning of the celebration, most of the faithful had attended the sacrament of Reconciliation, which permitted them to receive the Holy Communion. 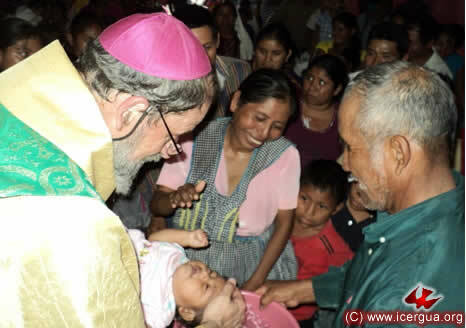 On Monday, Bishop Eduardo visited the Tzununá Community on the shores of Lake Atitlán. 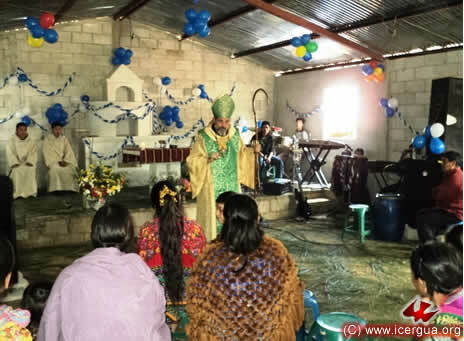 Following the efforts of several years, the faithful have built a cement-block church with metal reinforcement and a tin roof. Although the work is not yet completely finished, the faithful were very happy, for the Eucharist celebrated by the bishop was the first one in the new church. 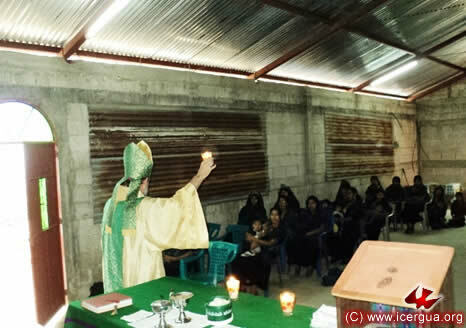 Although only a small portion of the faithful could participate because of the day and hour of the celebration, the bishop, in view of the readings, dwelt on the commitment to be light for the community. 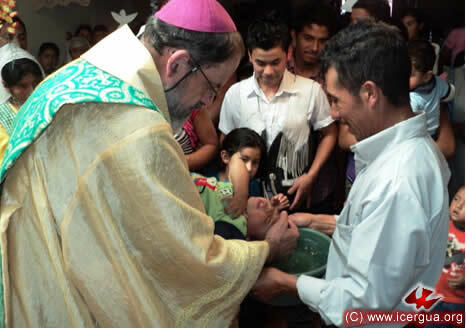 During the visit, the baptism and chrismation of a child, son of a member of the Music Ministry, were celebrated. 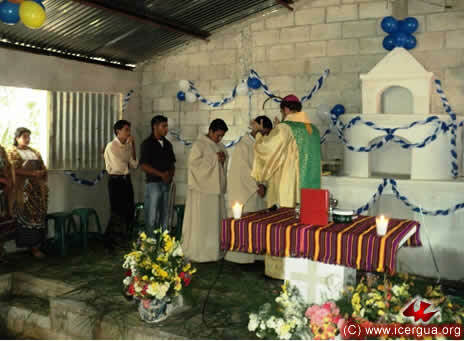 The faithful accepted the commitment to work for the growth of the community, just as up to now it has been working for the construction of the church building. 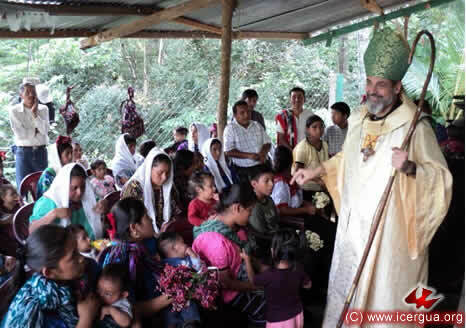 In late afternoon on September 19, the bishop visited the Jaibalito Community, located on the banks of Lake Atitlán in the municipality of Santa Cruz La Laguna. The faithful participated in good number and asked that the celebration begin with the administration of the sacrament of Reconciliation for all who recognized the need for it. After the homily the bishop asked the faithful to express themselves about their readiness to work, as true Renewed Catholics, in evangelism. The response was a unanimous commitment from the members of the community. Now follow-up is needed so that they can carry out their promise. 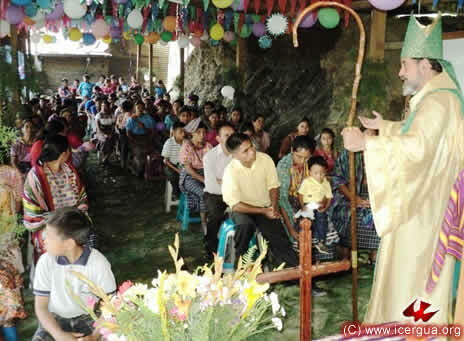 On Friday, September 23, Monsignor Eduardo visited the “Efusión del Espíritu Santo” Community of Santiago Atitlán. As always, the faithful participated in the celebration in great number. This community has about nine hundred members. It is estimated that during the current year the number of its members has increased by ten per cent. 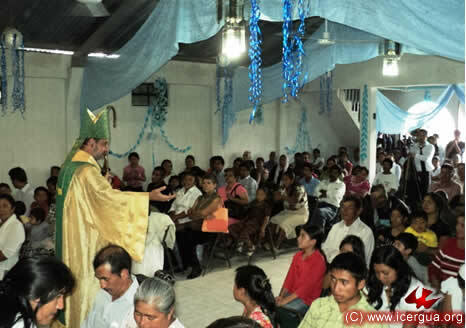 After the Eucharist, the bishop met with the leader and founder of the community, brother Cruz Toj, who is also president of the Pastoral Council of the Renewed Catholic Parish of “Espíritu Santo.” The goal of the meeting was to set the date for the first meeting of the Deanery that includes the communities of Sololá and the San Miguel Arcángel Parish of Totonicapán. 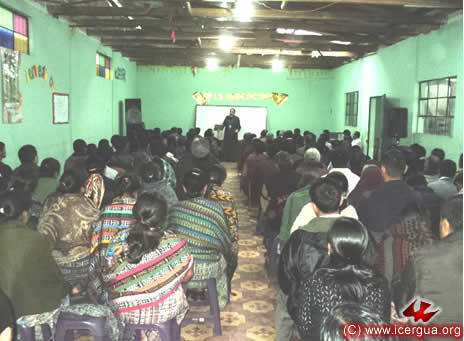 The first meeting will be held, God willing, on December 16, hosted by the Xolbé Community, Sololá. 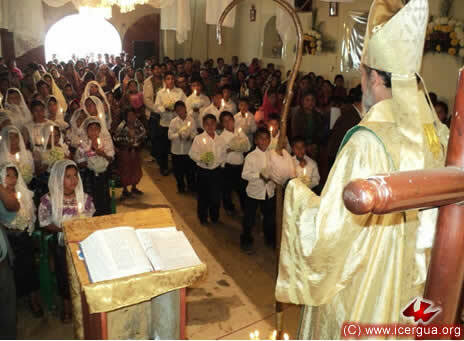 In late afternoon, the bishop presided at the celebration of the “Pentecostés” Community, also in Santiago Atitlán. 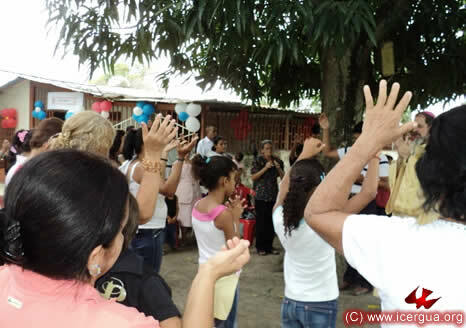 This community has passed through several difficulties and has not had the stability that was desired, but still has maintained its vitality, good organization, and numbers. Some of the faithful who withdrew for a time have re-joined, and there are also some new members. During the celebration, the Christian Initiation for the son of one of the most active families in the community took place. 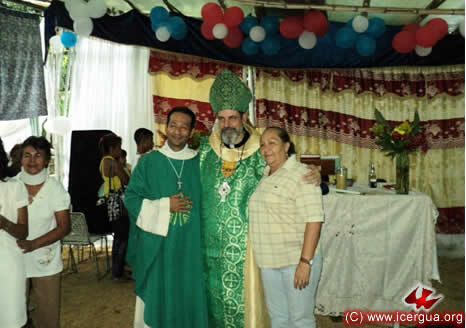 Right: In the back are brother Manuel, a Communion Minister, and his wife, who were the sponsors. 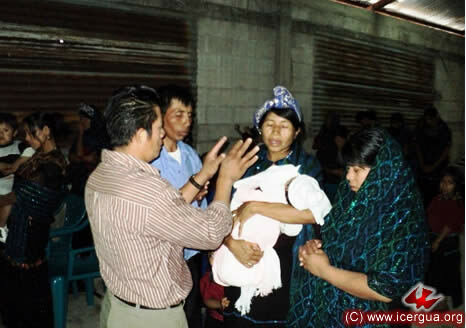 In the middleground are the parents of the child, and they are praying while the bishop carries out the baptismal ceremony. 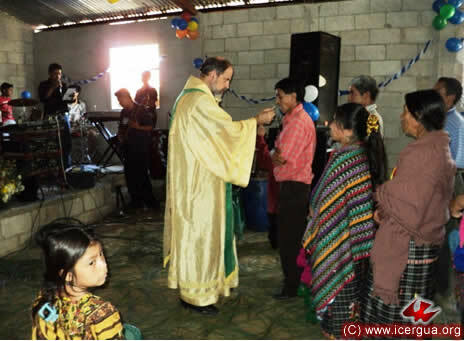 In the foreground are the bishop and brother Juan Pacach, who is the coordinator of the community. 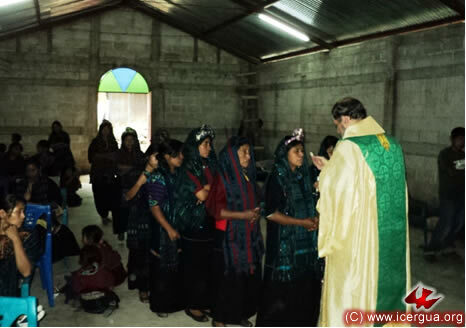 On Saturday morning, September 24, the bishop visited the community of Chuitzanchaj. 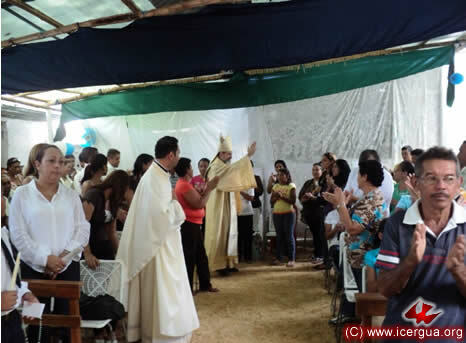 The reason for the visit was to celebrate the fourth anniversary of its covenant with ICERGUA and the arrival of the Most Holy Sacrament at the community. 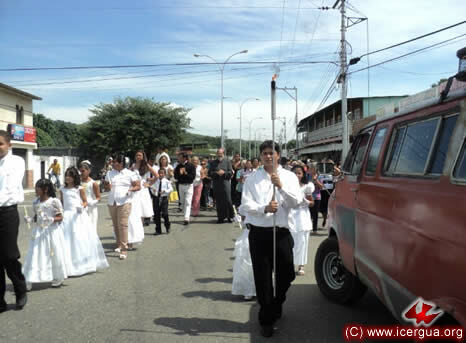 In past years a procession with the Sacrament has begun the celebration. This year, because a road is being constructed so that vehicles can come up to the church’s doors, the procession was not possible. By way of compensation, the faithful prepared splendidly for three celebrations of matrimony, and also of confirmations and first communions. 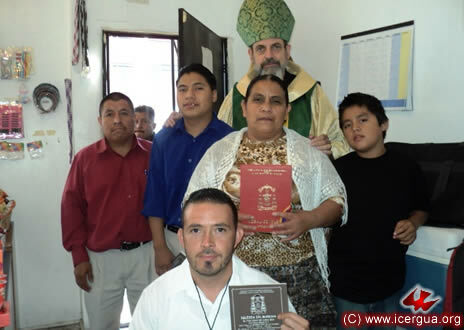 Right: Brother Manuel, the Community’s patriarch, and his wife were the sponsors of the all those who were confirmed. 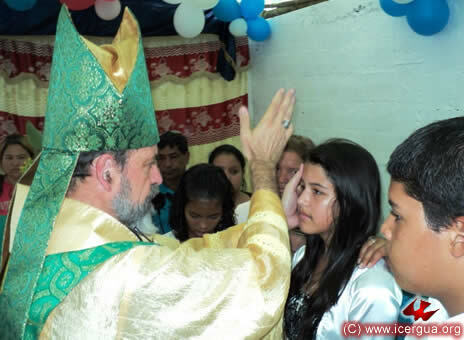 On celebrating the confirmations, the bishop stressed that with it the commitment is taken on to live and work apostolically, as did the apostles beginning on Pentecost. The three couples that contracted matrimony have been deeply involved in the life of the community since they were children. 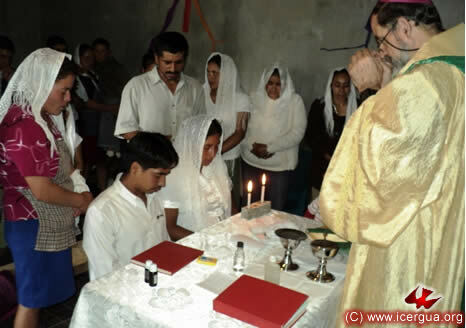 Now through the sacrament of Matrimony, they can reaffirm their commitment and above all participate actively in all the sacramental life of the Church. The children who did their first confession and communion were also carefully and thoroughly prepared. All of them showed much devotion and radiated deep joy. 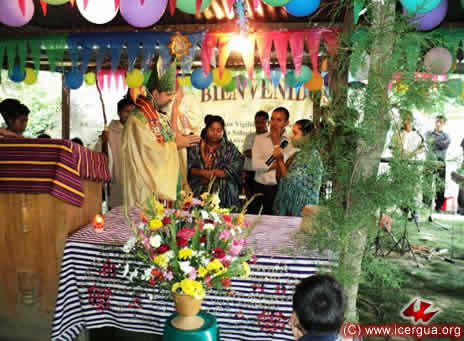 On the evening of September 24, the bishop came to the Los Pirires Community in San Juan Sacatepéquez, Guatemala. Last year the faithful bought a large lot on which to build a permanent church. 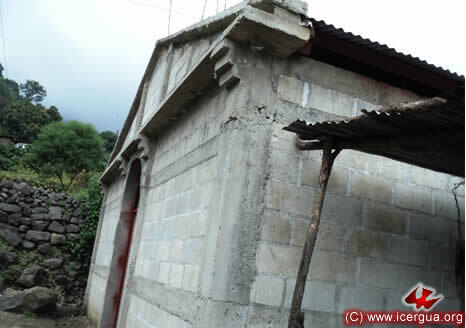 Owing to a lack of resources, at the present they have moved only the provisional accommodation, which had been in the home of brother César, the community leader, to the new location. With the Eucharistic celebration, followed by a vigil of prayer, they celebrated the move of the house of prayer and especially the move of the Most Holy Sacrament, which has been present in the community for two years, to the new place. 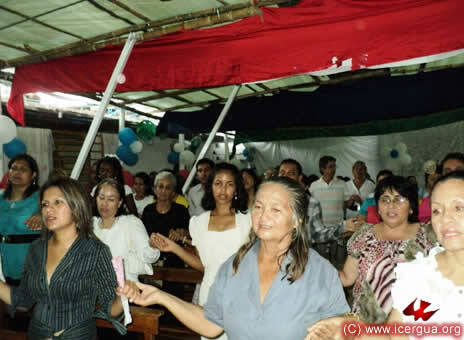 In the ceremony some of the faithful from the nearby communities of Los Guates and Las Palmas also participated. There were also the seminarians who are doing pastoral work in these communities. 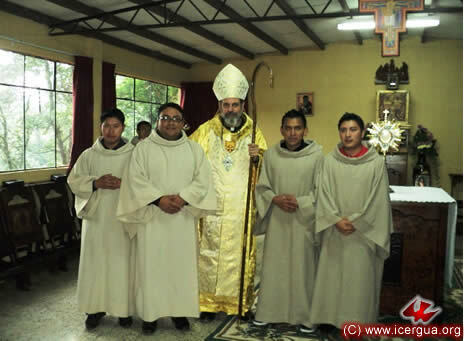 In the photograph at right are, from left to right, seminarians Juan Arcadio and Eduardo, the Communion Minister, the bishop, and seminarian Felipe. Not in the photograph are seminarian Alfonso and brother Julián Bal, who is the church’s chancellor, who were also present at the celebration. 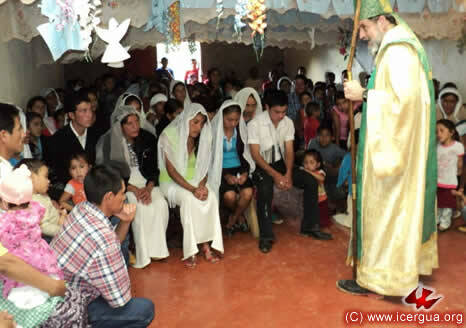 On Sunday morning, the bishop visited the Las Palmas Community in San Juan Sacatepéquez. About three months ago, when the community first joined the Church, the bishop went there for the first time. The celebration took place under an improvised galley. Now the faithful have built a beautiful church and took advantage of the bishop’s visit to install the Most Holy Sacrament, and those who will serve as Communion Ministers were installed as well. 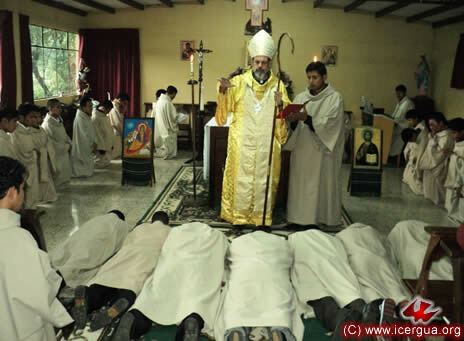 Left: The bishop administering Absolution to the seminarians who are doing pastoral work in Las Palmas: Arnoldo and Daniel. In the homily the bishop reflected on the Sunday readings and emphasized the serious commitment that the community made when it was established and also the great blessing that having the permanent presence of the Most Holy Sacrament in their midst means. After the profession of faith, the two brothers who had been chosen by the community were installed as Communion Ministers. Although their instruction is not yet complete, it was urgent that there be those who could serve in this capacity. 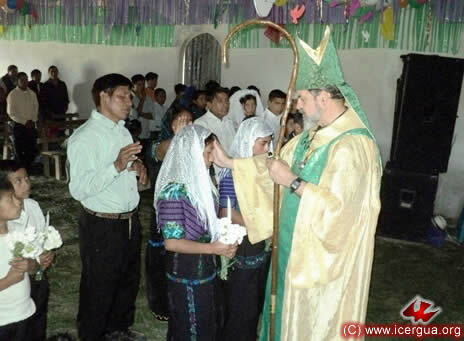 For ICERGUA as for any genuinely Christian church, Catholic or Orthodox, communion is at the center of its life. Through it, Christ continues to be present and carries out not only the redemptive sacrifice but also the outpouring of the Holy Spirit. That reality means that all the faithful must be thoroughly prepared in order to participate regularly in Holy Communion. 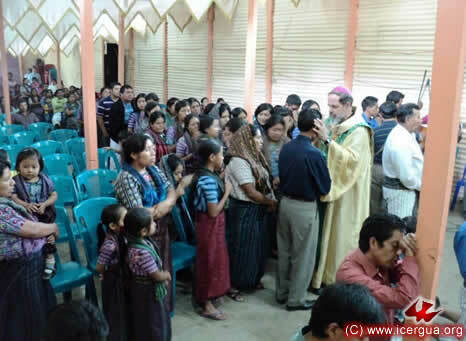 In the afternoon the bishop presided at the Eucharist with the Los Guates Community, also in San Juan Sacatepéquez, Guatemala. 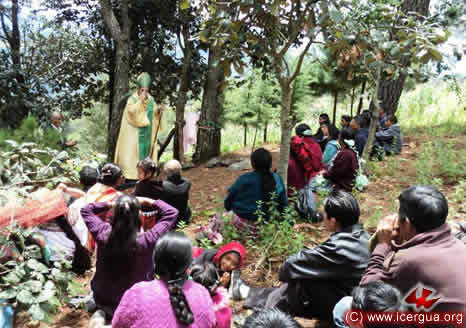 This community was the first in this area to make a covenant with ICERGUA. At present it has eight hundred members and is growing rapidly. 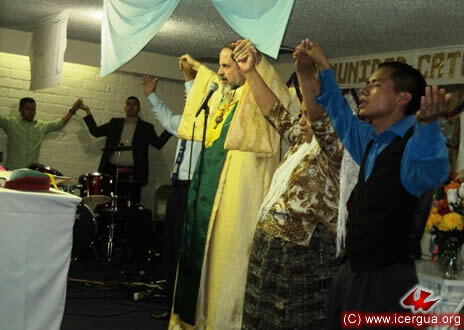 Its leader and founder is brother Calixto, who is at prayer in the photograph at left. 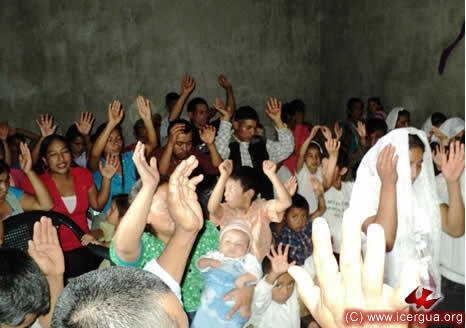 The faithful of Los Guates have bought a large lot on which they will build their church. But at present they are still meeting where they have met since the community began. Although the space covered by a roof has grown, the space itself has not changed. For the reservation of the Most Holy Sacrament and for prayer there is a small building dedicated exclusively to that end. In the homily the bishop urged the faithful to stay firm in their commitment to evangelize and to be completely faithful in carrying out the mission that the Lord has entrusted to us. The Communion Ministers along with seminarians Felipe and Juan Arcadio worked arduously to organize the administration of the liturgy. As result, there is a well-organized group of altar boys, readers and liturgists. 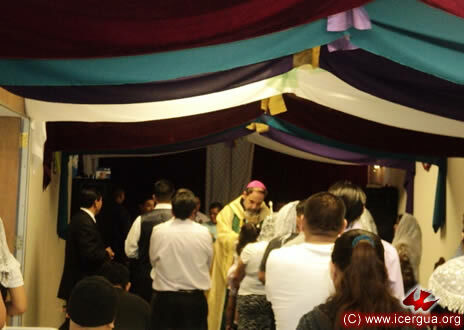 At the end of the celebration, the faithful wanted to honor the bishop by presenting him a lavishly made stole, woven by hand, with the colors and designs that characterize the San Juan Sacatepéquez textiles. 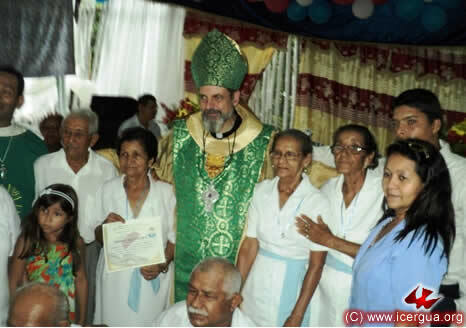 Right: The sisters who delivered the stole along with brother Calixto, who had just expressed the community’s gratitude to the bishop. 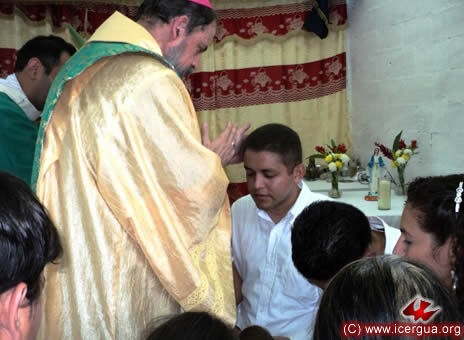 On Wednesday afternoon, September 28, preparation for the mission, “Living the Catholic Church that Was Born at Pentecost,” had its beginning in the Cathedral of San Juan Comalapa. 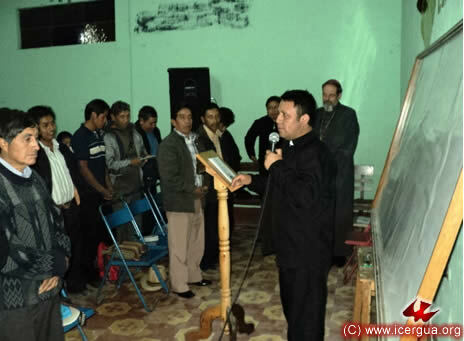 The mission begins in February of 2012, and the faithful are already hard work preparing for it. 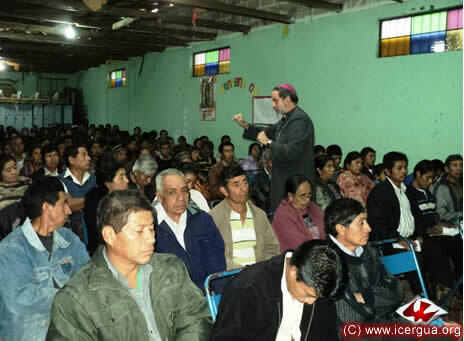 About three hundred of the faithful attended the workshop with the bishop, although only 95 had made a firm promise to participate actively in the mission. It is hoped that the mission will be a major step toward carrying out the mission that the Lord has entrusted to us. The planning of this project began three months ago, when the proposal was the bishop’s response to concerns voiced at the Parish Gathering. 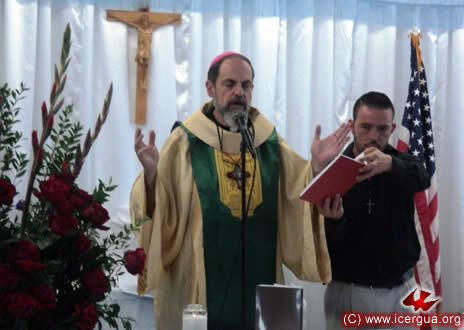 In the introduction the bishop explained the specific mission of our church and how it dwells on rediscovering, accepting and implementing in its totality the one, holy, catholic and apostolic church that was born on the day of Pentecost. Giving the details of these themes is helping the faithful to understand how our Church is living to the fullest all the characteristics of the Church that Christ wanted. 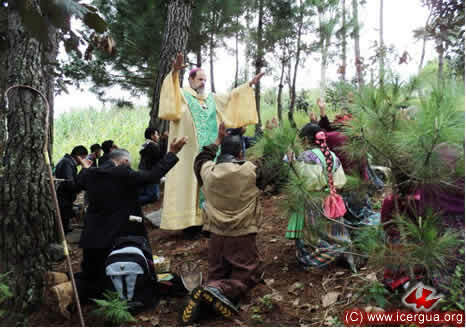 They are also deepening their understanding that He is the only pastor that is guiding through the continuous outpouring of the Holy Spirit, which is made efficacious especially through the sacramental life. The encounter is a path analogous to the one Jesus took with his apostles from Easter to Pentecost. In an appropriate place we shall make available to the readers the basic readings concerning those things that the faithful will be working over the next month in order to live the Easter experience along the side of Saint Mary and the apostles. After explaining the work and its process, the faithful had the opportunity to ask questions and clarify whatever doubts they may have had. At the end the bishop asked those present who were ready to become seriously and personally involved in the mission. 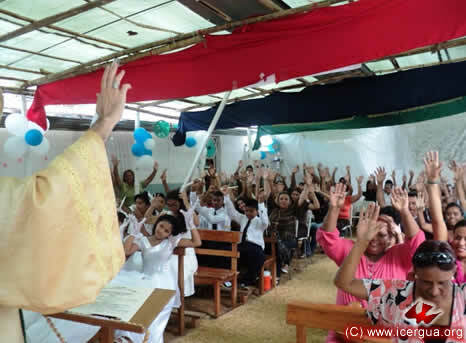 To a person, all those present raised their hand as a sign of accepting the mission and their participation in it. 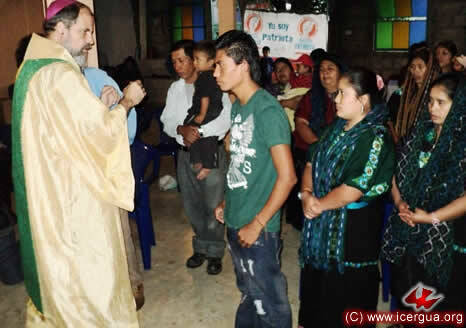 The two presbyters who have pastoral responsibility in the parish—Fathers Rigoberto, Vicar General, and Francisco, Pro Vicar General, are actively involved in the entire mission process. Father Francisco made the opening prayer, and Father Rigoberto the closing prayer and thanksgiving. 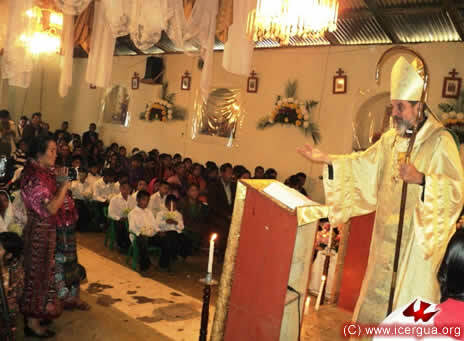 On September 29, Monsignor Eduardo was invited to preside at the celebration of the patron feast day in the Renewed Catholic Parish of San Miguel, located in Tzanixnam, Totonicapán. 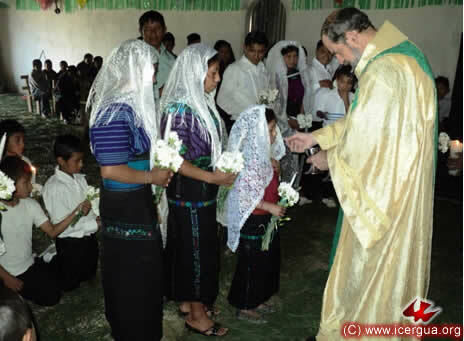 To solemnify the celebration, the catechists prepared a group of about thirty children to make their first communion. The parish church, the atrium and the adjacent extension were completely crowded with parishioners, who had come to renew and strengthen their faith. The homily stressed the significance of angels in the biblical context and the practical implications that recognizing a saint as one’s Patron should have, namely, as intercessor and as a model for conduct. The homily also emphasized the fundamental call, which all believers have, to live in complete sanctity as result of knowing God’s absolute primacy in one’s life. 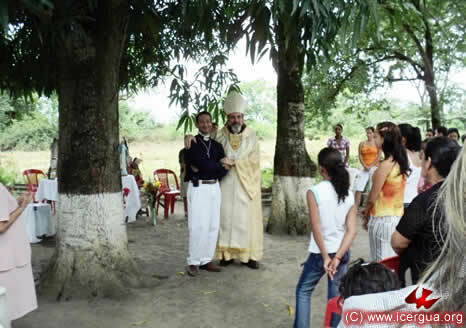 Co-celebrating with the bishop in the Eucharist were Fathers Gildardo Ramírez, pastor in the parish, and Fredy González, the first presbyter who resided in the community and who now works in the area of Alta Verapaz and Petén, but still remembers with great affection God’s People in Tzanixnam. Distributing the communion took about twenty minutes. 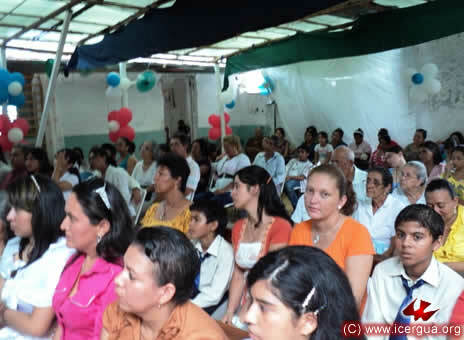 A huge multitude came forward to receive the sacrament. First to come were the children who were making their first communion that day. The mood that characterized the celebration was one of deep devotion, coming from a living faith. At the end of the celebration the bishop urged each of the participants to be committed to live out the faith and to give witness to the Gospel everywhere they go. 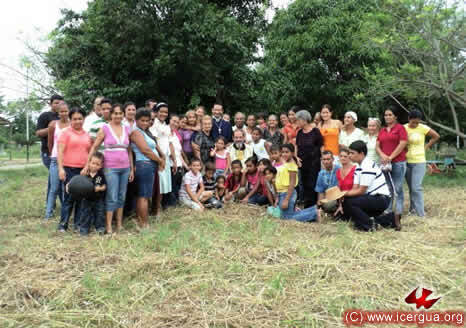 Seminarians Ambrosio Gómez and Jorge Tomás have been working in this community recently. Both have tried to help Father Gildardo move toward a comprehensive pastoral plan. At midday on Thursday, September 29, our bishop presided at the Eucharist in the seminary. In it the thirty-seventh anniversary of his ordination as presbyter was celebrated, and the order of Reader was conferred on four seminarians, and the order of Acolyte on three. The homily addressed each of these two groups that were to receive the different orders, and emphasized that the ordination is not only the recognition of an ecclesial ministry that in fact they have already been exercising for several years, but is above all the prayer that the Holy Spirit may bestow the grace that enables one to mold oneself completely to the image of Christ, having continuously the attitude of “hearing the Word” in order to be able to proclaim it, and also the attitude of a “living sacrifice” offered to the Father, in order to serve at the altar capably. In our ritual for minor orders the invocation of the Lord is anticipated through singing the Litany of the Saints while the candidates, prostrate, implore the outpouring of the Holy Spirit from the Lord. During the singing of the Litany the bishop enters the Litany to pray the Lord to send the Holy Spirit to those who are receiving orders so that they can carry out the ministry that is conferred on them with integrity and competence. After the prayer of benediction the bishop followed by Father Juan Moisés and Deacon Orlando come to pray over each one of those being ordained readers. The bishop ends the ordination, praying, “By their constant dedication to reading the Scripture may they acquire the capacity and efficacy to carry out their ministry, may they proclaim with vigor your Word and, by the example of their life and ministry, may they practice in life what they proclaim, and so may contribute to the building up of your Church. For the sake of our Lord Jesus Christ. After praying the benediction, the bishop and each of the ordained ministers present pray over those who are being ordained. Each of three ordinands received the symbols that distinguish their ministry. 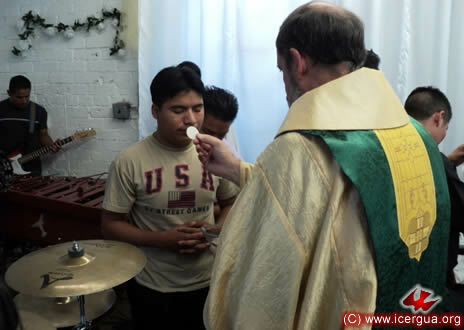 Those just ordained are to be responsible for presenting the gifts that are presented as the Eucharistic offering, outwardly symbolizing the commitment they have made in becoming “living sacrifices,” acceptable to the Father. At the end of the celebration, everyone expressed joy with applause and greetings. 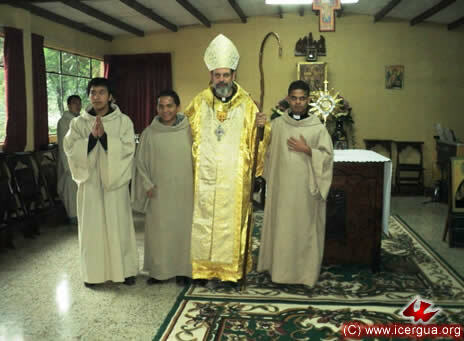 The three who were ordained acolytes with the bishop, from left to right: José Alfredo Hernández Chávez, Robinson Cumes, and José Alonso Hernández. 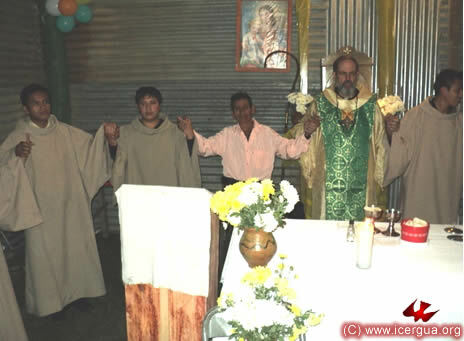 The four readers with the bishop, from left to right: Arnoldo Martínez, José Raul López, Jorge Tomás and Eduardo Mateo.